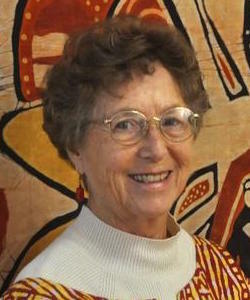 Background: Sister Jean Pruitt has spent 50 years in Tanzania as a Maryknoll sister working on wide-ranging activities that focus on poor communities and on children. She is widely respected as a leader who gets things done and keeps children at the forefront, over the years establishing a remarkable series of institutions, notably giving young artists and disadvantaged youth a chance to succeed in life. The art centers she has established have transformed the scene in Tanzania and opened new paths, and she has accompanied and supported Tanzania’s efforts to address the challenges of disadvantaged youth in changing political times. Sister Jean has been part of the Global Network of Religions for Children (GNRC) from its inception, and she spoke with Katherine Marshall during the Fifth GNRC Global Forum in Panama on May 9, 2017. She focuses on how she came to focus on the projects and topics that have dominated her work, on what has so attracted her to Tanzania and Africa, and on the role that the arts can play in unleashing talents and offering a path to hope. She sees mentoring young people as a far more desirable approach and framing than deradicalization. Sister Jean’s courageous and generous spirit runs through the discussion. Let’s start at the beginning. How did you come to join the Maryknoll Sisters? It really began with National Geographic and my grandfather, who subscribed to it. As a seven-year-old, I devoured each issue and was fascinated by the pictures of Africans, always smiling. From that moment, I wanted to go to Africa. I went to a Catholic girls' high school in Los Angeles, where I came from. During my years in school, I always wanted to be a sister. I met a boy in high school who for years tried to get me out of the sister bit. But I still wanted to do it. When I heard that Maryknoll sisters go to Africa, that convinced me! A friend who was a sister recommended me. I was refused the first year I applied but was assured that I would be accepted the following year, and I was. I think God makes my life interesting by pulling me around all the time—it’s as if the “hound of heaven” is chasing me. So I was accepted and joined. Right after profession I was assigned to the kitchen. Indeed, yes. I spent three years there. After I finished the novitiate I was assigned back to the kitchen for another year. And then I was sent to Molly Rogers College, followed by four years of teachers' education. But what I really wanted to do was community development, not education. So I went to Buffalo University and completed a program in social welfare. While I was doing this I was tipped off that the sisters were looking for a social worker to go to Taiwan. Assignments in the Maryknolls are always kept in the shrouds—when you get an assignment it is as if the Holy Spirit flew down. I made clear, however, that there was no way I was going to Taiwan. I wrote a letter saying that I would go anywhere but Asia. I was determined that I wanted to go to Africa. I was working at the coffee urn at 4:00 a.m. one day and a friend tugged on my skirt and whispered “You are going to Tanzania.” That was in 1968, and 50 years later, apart from time spent at home, that is where I have been. And I feel I have been lifted up by it. Perhaps God was out to lunch when I was born, because I was supposed to be born in Africa, not California. What so attracts you to Africa? I found people there who smiled and laughed. It is in the character of Tanzanians and, I think, other Africans. If I walk down the street, even on a truly terrible day, the smiles touch my spirit. There is a sense that life is not hopeless. And there is beauty: the trees, the sun, the air, the communities, and the people. It lifts up my spirit. What did you do when you got to Tanzania? When I first arrived there was no obvious job for me. We normally went to places with a clear job, an assignment, for example teaching, health clinics, or pastoral work. But I did not fit, with my interest in community development. I knew that I wanted to do art, but the Maryknoll Community did not believe in sending out artists, at least at that time. Today there are in fact Maryknoll Sisters who began their ministries in their professional talents. In my beginnings the arts were not considered legitimate paths, even though in my heart of hearts I knew they were. Wonderfully Pope Francis declared that artists are missioners of mercy, lifting up society from its difficult times, creating hope and joy. My first job was with Catholic Relief Services (CRS). I was engaged in socioeconomic projects, and that fit my dream, at least a little. In my CRS assignment I travelled all over Tanzania, looking at under-five clinics, nutrition programs, etc., even though I really had no background in these areas. We formed a team with an Indian woman, a Tanzanian, and myself, and we called ourselves chocolate, coffee, and vanilla. We worked together for four years. During this period I was also looking at arts, crafts, and creative works. That included weaving and pot making. By 1972 I had seen a lot of road accidents, and I feared to become one of them as I spent so much time on the road. I began Nyumba Ya Sanaa (NYS), or the House of Art, with a group of Standard VII school leavers, and it grew and grew and grew. It became quickly the central window of art in Tanzania. President [Julius] Nyerere, now called the "Father of the Nation," had a great interest in the arts, and he became the patron of Nyumba Ya Sanaa. Nyerere offered NYS a piece of land, then sent me to the donor community to get funding to build a center. Building the center was a wonderful experience, because the artists and artisans were engaged in the design and construction of what would become their future home. Construction began in 1981, and in 1983 by Nyerere himself opened the center. We started with 50 artists. At its zenith NYS had 600 craftspeople from all over the country engaged in marketing their crafts, and 180 youth were fully employed at the center. It is a vibrant place. Maryknoll Sisters serve our center by rotating services, and it was my turn to go back for three years to provide a service that enables our sisters to serve in mission. I was assigned to the communications office and began work on the Maryknoll magazine, which was a wonderful experience. I learned photography, which had always fascinated me, as a camera was outside my budget. I also learned Photoshop and so forth. The three years allowed me to visit our sisters in the Philippines, Majuro, and Yap, to gather their stories and photograph their works, focusing on the power of stories and on photography. Serving with the magazine team was inspirational at all the levels of production. Upon returning to Tanzania I rejoined the team that was working with street children, known as Dogodogo Center, which I began in 1989. How did you come to focus so sharply on children in your work in Tanzania? I have a love and passion for many things, but children are the common thread woven always with the thread of creativity expressed in art. A colleague I was living with had a five-month-old child, and so it began. I ended up raising five Tanzanian children. Kizito, the first, is now 48. His mother, my beloved friend, has since passed away. Each child has his or her own story. Now they are all adults and all have children, so I am a grandmother of eight! While I had young boys around me, street children started appearing in the late 1980s. I became acutely sensitive to how they were being mistreated. So I joined hands with other NGOs in Dar es Salaam to see how we could respond to living and working on the streets. All face extraordinary hardships. The center we created was named by the children: Dogodogo Center. Dogodogo means "little ones." Dogodogo Center was officially recognized in 1992. It was a project that grew even while I was away. We have graduated 2,000 children from primary school and an additional 500 from vocational school. We were able to build a vocational training center that is especially meaningful for vulnerable youth. In addition to the children living on the street we enrolled young people who were working in the rock quarries. They were more enthusiastic, ostensibly because the classroom was better than crushing rock. Dogodogo Center also has a multimedia center, as my love of arts carries over. It links into the entertainment business, training youth in music, dance, videography, and other skills. Twenty-five of our youth were chosen to go to EXPO 2015-Milan. It was a great moment for the group of youth, who did 14 performances. This was followed by an invitation to perform at the EU Summit in Brussels in 2016. It was wonderful for the group of youth, who performed for an audience of some 40,000 enthusiastic viewers. In 2006 I was able to obtain corporate support to continue the great energy of Nyumba ya Sanaa with a new approach. The new art project has become known as Vipaji, which means "talent." It is the hope of this project to take a lot of artists out of the shadows and empower them to share their creativity and talents in schools, in museums, in exhibitions, on the web. But most importantly to spark and ignite the passions of Tanzanian artists through a journey of connectedness in image, form, color, body, lines, and shapes that spiral and dance in the lives of all who connect with their dreams. Ultimately the aim is to help artists to find and develop markets. Vipaji does six exhibitions a years and has become another vibrant center. A special joy for me is that some of the artists were 15 or 16 years old when we began, and they are now almost old men at 50 years old or so, still working and creating. You have also been involved with refugees. How did that come about? In 1988 in Tanzania I attended a regional assembly with Maryknoll sisters. The focus was on the option for the poor. African refugees were a big problem at that point. It struck a chord, and I offered my services to one of our sisters, Janice McLaughlin. She had founded the Zimbabwe Mozambique Friendship Association and was over her head in work. I asked the Air Tanzania CEO if he would give me a commuter ticket (since I did not have resources for frequent air travel!). He generously said yes. As I got immersed in Zimbabwe I came to realize that we can do this in Tanzania. I knew the former Mozambican ambassador to Tanzania, who by then was the ambassador to Zimbabwe. He enabled me to network in Tanzania with those who were passionate about Mozambique, and I was able to start up Tanzania Mozambique Friendship Association. There were hundreds of thousands of refugees crossing the border of Malawi, Zimbabwe, and Tanzania at that time. Again things came full circle. We were able to work with artists and carvers in Mtwara and Zimbabwe. The World Bank gave support to research and bring to light “People Beyond Borders.” We became advocates for artists and artisans who had families on both sides of the border. Working with immigration to be more sympathetic to their plight was important. We worked for eight years in the refugee camps; there were 20,000 in Songea and another 2,000 at Newala, south of Masasi. And then in 1992 peace was established, and a large number were able to go back. The camps were mostly vacated and turned over to the Tanzanian government. A secondary school for Tanzanians and a wildlife college grew out of the hardships of the refugees in the camps. How did you come to connect with Arigatou International and the Global Network of Religions for Children? Back 2000 and 2001, the head of the Maryknoll sisters asked if I would like to go to Japan, with an answer needed in the next 24 hours. It was a great invitation, with a focus on children, so I went. At this First Forum, it was clear to me that there was a striking absence of Africans in attendance, and those who were there came mostly from South Africa. After I shared my concerns with Rev. Keishi Miyamoto, he gave me an invitation to “start something.” The foundation was already planning the conference called "Children for Coming Generations." We got five invitations, all for Dogodogo children. And that is how it started. A short time later in 2001 we held our first forum with 15 African countries and 45 participants. We called this new beginnings East and Southern African Network for Children (ESANE). I was not as sure that we should start a global network of religions for children for all Africa. I wondered how could we expand ESANE all over Africa, and would we be duplicating another children’s network. I was assured by the secretary-general of the African Conference of Religious Leaders that there was an urgent need to establish a GNRC-Africa. With funds from the Arigatou Foundation I hired an exciting woman, though what she really wanted was to go to school to become an environmentalist (which is what she has done). Mustafa Ali, who is now the secretary-general of GNRC, volunteered to take the position as GNRC-Africa coordinator. We worked together for four years. Mustafa then left to work with Religions for Peace as secretary-general of the African Council of Religious Leaders. The Arigatou Foundation respected his commitment to the extent that he was invited to become the first non-Japanese secretary-general of GNRC. Before he was appointed as the head of GNRC, we were partners in creating the Fourth Forum of GNRC in Tanzania in 2012. You have lived through an intense period of Tanzania and Africa’s history. What has struck you most forcefully as you look back over the years? I am continually amazed by Tanzania and what it has become. Perhaps the most shocking thing is the uncontrolled population growth and its impact. With CRS, family planning was just coming onto the scene as the most important issue. And Planned Parenthood was active. But then family planning seemed to have lost its luster. Kenya’s rate of growth was greater than Tanzania’s, but in the last few years the effects of neglected family planning are so visible. In some of the suburbs of Dar es Salaam, areas which were very low density, have suddenly become high density populations, filled with young people. The population of Dar es Salaam was 800,000, and now it is 4.5 million. UNICEF states that the 50 percent of the population of Tanzania is under 18. Recently in Dar es Salaam I walked past a group of youth who were just sitting on a concrete embankment. I waved, and they waved back. Six hours later they were still there—young people with no jobs and nothing to do. No wonder there is violence. We need to be looking at entrepreneurial leadership. And there are some good examples, for example some programs in Zanzibar that have done wonderful things. But when youth are held down and have nothing to do, elders cannot keep them in check. It is a perfect recipe for Al-Shabaab. What I see as most important is to give meaning to whatever young people do. “Deradicalization” sounds terrible to my ears. Youth mentoring sounds superb. GNRC-TZ, with the support of NORAD, held its first Leadership Mentoring Program in Zanzibar for 25 youth. Besides learning entrepreneurial skills the youth learned how to volunteer in the community. During the five-month training the youth took up three issues in which they could serve the community. Cholera, drugs, and environmental clean up became their focus. At graduation some business executives were invited. They were knocked off their seats, because they had not seen the potential in young people. It is amazing what can be accomplished in a short time. The youth themselves established in January their own NGO: Zanzibar Youth Volunteers. The youth are not poor; they are simply under-capacitated and unemployed. Some years back I tried to get ILO with its vast resources to initiate a global internship program in business agriculture and industry. Internships for youth are critical for sustainable development. The evolution of the political system is also something I have lived through. It has evolved from socialism to the start at least of a multiparty democracy. Nyerere saw that socialism was not working. Socialism was too early. Politicians were not prepared, and it did terrible things to people; it enabled greed to grow. Nyerere had an interview with a Norwegian journalist. He made a profound comment. He said that he himself had failed to see the importance of issues around management. And so he failed. Where do you hear a president admit failure? Nyerere did. That realism helped with the transition from socialism to multiparty democracy. How many Maryknoll sisters are there now? There are under 500, and the average age is 87 years old! As Molly was prophetic in her time, the present community are already looking at religious life in the twenty-first century. A time for refounding? The Maryknoll Sisters of St. Dominic, Inc. was the first U.S.-based congregation of women religious dedicated to foreign mission. It was founded in 1912 by Mary Josephine “Molly” Rogers, a graduate of Smith College. The headquarters are in Ossining, New York.